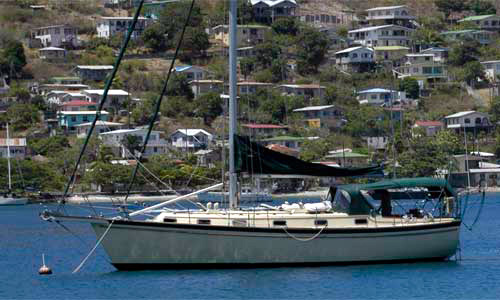 So... we found an IP 38 in Saint Thomas and the owners are motivated to sell. They will discount the boat if they don't have to move it to Florida. We've agreed on a price and we are set for sea-trials on Monday, March 9 during Spring Break. We are aware of a number of deficiencies on this boat... the AC doesn't work, the generator is pooched and the watermaker needs a new membrane. There are lots of signs of wear and tear and we will be doing lots of minor maintenance. However, we never thought about putting AC on the boat. Also we were hoping for solar and wind to supplement our power and our friend Gary has built his own watermaker that he swears by. These things aren't deal breakers. We learned later in the negotiations that the autopilot doesn't work and that concerned us. But... the owners are willing to make that problem go away so we feel good about that. 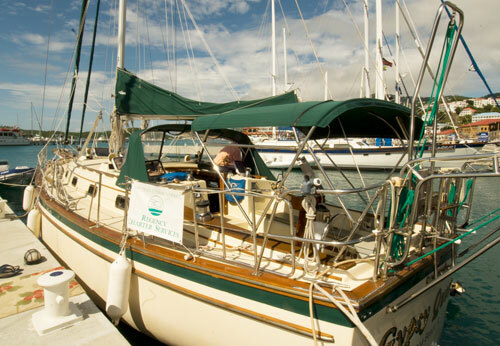 We will have to put new sails on in a year or so, the caprails need to be stripped, sanded and varnished and we'd like to get the hull polished and waxed. On the plus side, the price is great, there is a decent dinghy and a new outboard to go with it. The water and fuel tanks often deteriorate on these boats but this one has had them replaced. There are tons of extras with this one. It has radar, SSB radio, the dinghy and motor, davits for the dingy, a life sling and on and on. We can see us making significant upgrades over the next few years but it looks darn good! We're hoping we step aboard and fall in love with it. The boat is currently named Gypsy Queen. Do we keep the name? We don't hate it. Or, do we call her Miss Pearl 2? Or is there something better? We are having a hard time with that.